Camel milk makes up only 0.3% of the total world milk production (cow milk constitutes 83.1%), but they are so many products out there! 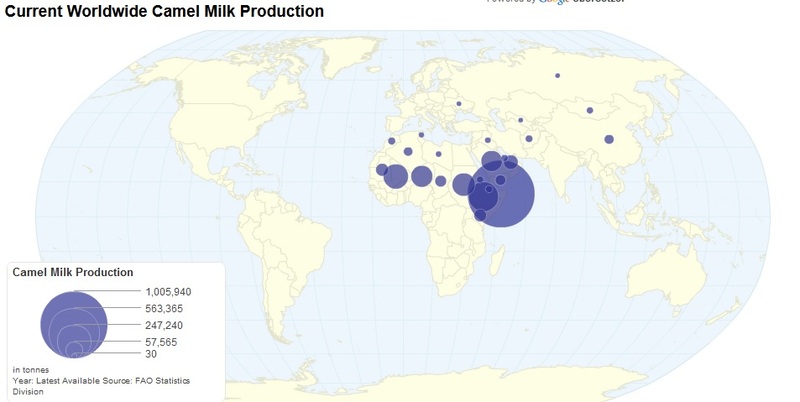 And, camel milk production is growing – more and more products enter the market. Some are just too exotic to be good. For example, around 2009 the first camel milk chocolate was put on the market (I will not name the brand here, but google it and you will easily find it). Camel milk chocolate is a great idea but at the moment the product lives from its exotic status. Trying it I could taste the difference to cowmilk – and it is a great idea to make chocolate out of camel milk. But, the other ingredients (like the vanilla flavor and the melting potential of the chocolate) were not well orchestred. Even though there is (in my opinion) room for improvement, of course other people loved it. And, it is worth at least 1 or 3 tries – go for it! The chocolate is a product of Dubai – a place where the “camel milk industry” is getting more and more industrialized. In 2009, in Dubai a camel milk pasteurizing facility opened and they seem to be a great success – claiming that the demand is at the moment higher than the supply. The only research facility dedicated to camel milk is situated in India though. Camel milk made Nancy Jones Abeiderrahmane famous. This really amazing woman published a book one year ago (titled „camel cheese – seemed like a good idea“) that tells her story how she founded the first camel milk pasteurizing facility in Mauretania. Nowadays, her company sells everything made out of camel milk – ranging from cheese to yogurt. And, they are an important contributor to the Mauretanian GDP. The book is a really good read by the way, too. A similar business was opened in 2005 by German Holger Marbach in Nanyuki, Kenia. His Camel milk farm “Vital Camel Milk Ltd.” Offers a wide range of bio-products made from camel milk – ranging from milk, sour milk yoghurt to ice creams of all kinds of flavors. You can produce milk powder from camel. It is possible to spray dry it just like cow milk. The procedure differs from cow milk as you have to do it at 5°C lower temperature, you will get larger particle size and the powder dissolves quicker in water again. Good to know! Of course, you may want to prefer not to pasteurize or cook the camel milk. This is because camel milk is pretty rich in not very heat-resistant vitamin C (around three times higher than cow milk). In fact, camel milk has a lot of healthy stuff in higher quantities than cow milk (B vitamins, copper, iron, manganese, magnesium, potassium, sodium, and zinc). It is also lower in lactose and cholesterol (unfortunately in vitamin A and B2, too). The Kazakh traditionally preserve all the good ingredients by conserving the camel milk without cooking it. Their national food Chal is a fermented version of camel milk and very good to drink! If you want to make camel milk cheese yourself, you can find the information here. If you want to learn more about camel milk in general, start here.